A total of 5,200 teenagers were surveyed for the research, conducted by investment bank and asset-management firm Pipar Jaffray. The study found that 33 percent of teens called Facebook the most important social network. But Twitter is not far behind, with 30 percent of teens naming it their preference for social networking. Just six months ago, a fall 2012 study by Pipar Jaffray found those numbers to be 42 percent for Facebook, 27 percent for Twitter, so the gap is narrowing between the two. 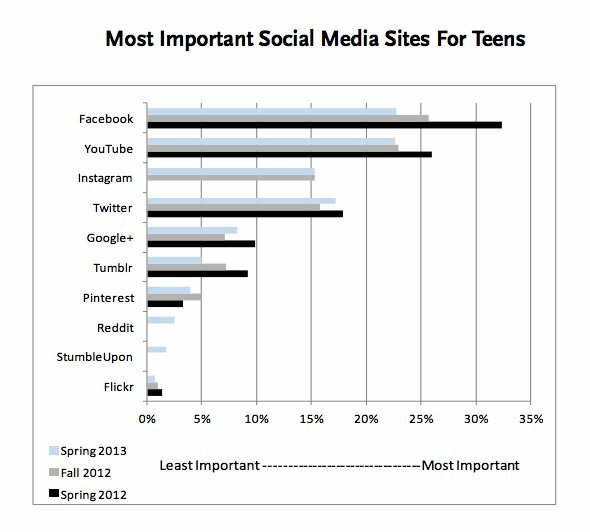 Instagram came in third with 17 percent of teens calling it the most important social network. Of course, it's owned by Facebook now, so if you want to get technical, Facebook may have a larger lead over its competition. Google+ came in at 5 percent, Tumblr 4 percent, and Pinterest 2 percent. Four percent of respondents said they preferred other social networks as their network-of-choice. Write-in responses included Wanelo, Vine, Snapchat, Kik and 4chan. Again, Facebook's popularity is declining, if you look at the black bar representing results a year ago or the grey bar for results in the fall. YouTube is right there with Facebook as a popular site. Twitter and Google+ have grown in popularity since the fall, while Tumblr and Pinterest are declining among teens. TechCrunch concluded about the results, "Just as much as Twitter poses a threat, so too do these up-and-coming social apps that have taken teens by storm." Among those apps are Snapchat and Pheed, which was not mentioned in the study. Another finding in the Pipar Jaffray study, which you can read in full here, was that more than half of teens believe social media impacts their purchasing habits.